Contact J﻿oanna Mendoza﻿ for enrollment information and to schedule a tour today! Where Kids Learn to Love Learning! Children who spend their early years in a supportive, stimulating and responsive environment receive the essential foundation they need to prepare them to succeed in school and in life. 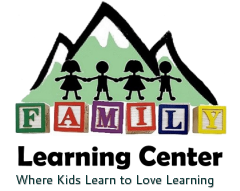 At The Family Learning Center, we believe that nothing is more important that giving all children access to a high-quality learning environment during the critical years before they enter school. It is our goal to provide the experience and expertise that will empower families and engage children to maximize their future learning potential. The Creative Curriculum is designed to meet the basic needs of the children. Inside the classroom, the Creative Curriculum teacher creates an atmosphere in which children feel safe, feel emotionally secure, and have a sense of belonging. It describes activities and teaching strategies that are challenging, yet within the children’s reach. It also suggests giving choices and a role in determining how they learn. This curriculum helps children acquire social competence and the skills they need to succeed as learners. It discusses the characteristics and experiences that make each child unique, including temperament, life experiences, dual language learning and disabilities. It offers strategies for building positive relationships, helping children develop self-regulation, and responding to challenging behaviors. It shows teachers how to guide children’s learning during daily routines and everyday experiences. It also explains the role of assessment in learning about each child, following children’s progress and planning. The curriculum explores the benefits of working with families as partners in the care of their children. The curriculum touches on how partnerships are built by exchanging information on a daily basis, involving families in all aspects of our program, communicating in respectful ways, and working through differences in ways that sustain the partnership and the benefit of the children. The Creative Curriculum helps teachers be intentional about the experiences that they offer while still having the flexibility to respond to the changing interest and abilities of the children.